when he first started a bus service in Madurai district in 1912. He established the T.V. Sundaram Iyengar and Sons Limited in 1923 which now operates a number of buses and lorries under the title of Southern Roadways Limited, besides many depots and service stations. During the last war, to meet the petrol scarcity, the TVS designed and produced the TVS Gas Plant. 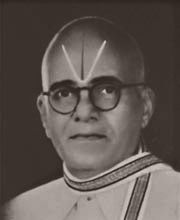 Mr. Sundaram Iyengar also started a factory for rubber retreading, besides two more concerns, the Madras Auto Service Ltd. and the Sundaram Motors Ltd., the former being the largest distributors of General Motors.and transport operators in the South. Established in 1946, Southern Roadways started as a road transport and parcel service company. The Passenger Transport Division was nationalized by the Tamil Nadu Government in 1972. In this high priority industry Southern Roadways has been playing a leading role for over 58 years now. Southern Roadways, a member of the TVS group of companies, as a totally reliable field operator, is known for its concern for customers - in terms of timely delivery, safety and personalized service of the highest standard. As a result, Southern Roadways has attained the undisputed stature of being the largest goods transporters by road in South lndia. Striving constantly to match the vast network of roads, Southern Roadways has been expanding its own network of booking and delivery points. Today Southern Roadways is closer than ever to the people with 465 booking and delivery points including nine full-fledged branches and three depots located at major cities. For its customers, Southern Roadways offers a very high degree of prompt service, reliability and convenience through several facilities and features. Over 305 well-maintained and fully-owned trucks travel in excess of 60OOO kms every day. These are fully covered and locked trucks protect consignments against the vagaries of weather and pilferage..
Trucks depart and arrive as per schedule whether they have full• load or not ensuring timely delivery of all consignments. Southern Roadways\' fully-insured warehouses and its highest road safety record ensure security and safety of consignments. Comprehensively computerized monitoring of operations and constant surveillance resulting streamed and smooth transportation of goods at all times. Dedicated! disciplined and caring staff in the best traditions of TVS anticipates and fulfill the needs of every customer - small or large. These factors, along with unswerving commitment to the customer in terms of totally reliable and cost-effective service, have earned Southern Roadways the enduring goodwill of a wide cross-section of customers. Individuals and householders, merchants and professionals, manufacturers and distributors. In South India, Southern Roadways continues to retain its leadership by promptly and safely delivering goods to every section of society. Parcel service booking and delivery, organized through 12 branches and 562 booking offices in the four southern states. All Rights Reserved.Copyright 2007-2008 TVS Southern Roadways Ltd.